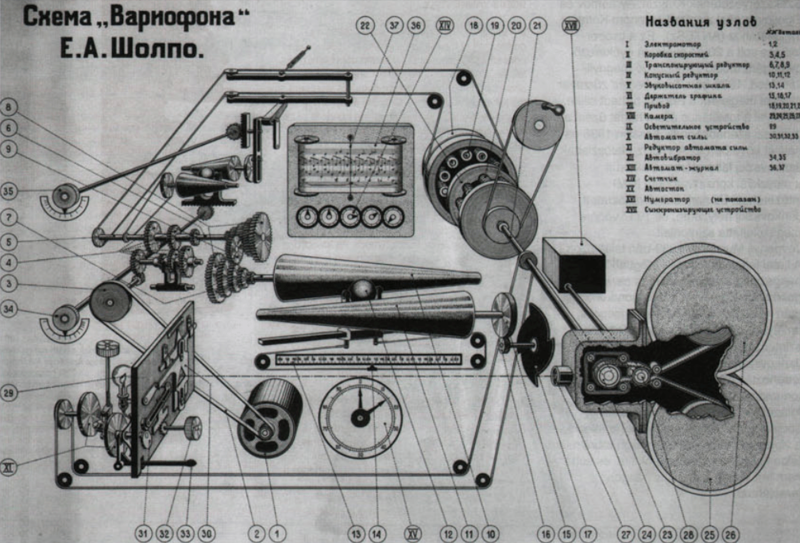 Developed in the Soviet Union in 1932 by Yevgeny Alexandrovitch Sholpo and Georgy Rimsky-Korsakov at the Central Laboratory of Wire Communication in Leningrad after several years research into performer-less music; the Variophone was an photo-electrical electronic instrument. The particular method used by the Variophone was a type of optical audio recording designed to allow the composition of lengthy polyphonic pieces of music. This was achieved by cutting sound waves into cardboard discs rotating in synch with a 35 mm movie film. This was then re-filmed and played back on a normal movie projector that and amplified through a speaker. In a simple ‘overdubbing’ process the process could be repeated to create multiple layered tones. Soundtracks were able to contain up to twelve voices, recorded as tiny parallel tracks inside the normal soundtrack film area. By 1931 with the help of Rimsky-korsakov, Sholpo produced soundtrack to the film ‘The Year 1905 in Bourgeoisie Satire’ and again in 1932 a synthesised soundtrack for ‘A Symphony of Peace’ and many other soundtracks for films and cartoons throughout the Thirties and Forties. At the end of the long 1941 Siege of Leningrad, the Variophon was destroyed during a missile attack. 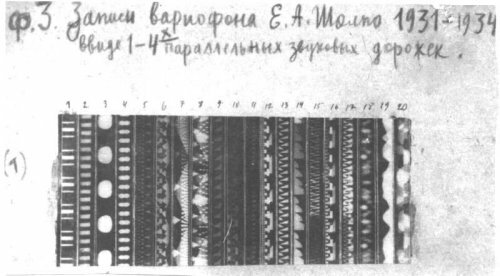 After World War Two, Evgeny Sholpo became the director of the new ‘Scientific‐Research Laboratory for Graphical Sound’ with Boris Yankovsky at the State Research Institute for Sound Recording, in Leningrad.. The fourth and final version of Variophone was never finished, despite promising experiments in musical intonation and the temporal characteristics of live musical performance. The laboratory was moved to Moscow and Sholpo was removed from his position as director. In 1951, after a long illness, Evgeny Sholpo died and his laboratory was closed.Archive material from the Variophone was recently transferred in 2007 to the Theremin Center. 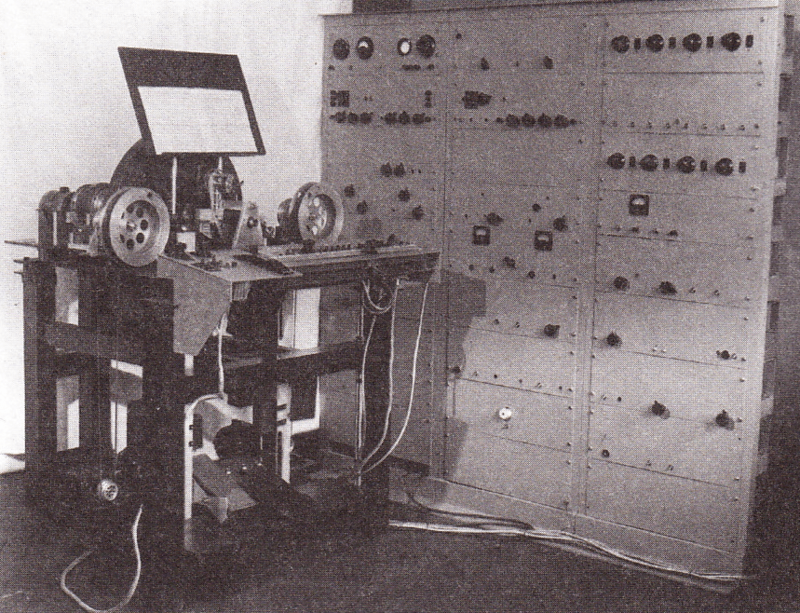 The hand drawn optical synthesis technique was also used later in the 1960’s by Daphne Oram in England.